If deep cracks and painful, dry skin around your nails are starting to resemble a desert landscape, take quick action to restore the skin to silky smooth softness. Before you spend money on store-bought products, grab some natural ingredients from the pantry to create a soothing homemade treatment. With regular application, haggard-looking hands can look and feel baby soft. Open a tub of Greek yogurt and scoop out 1 to 2 tablespoons into your hand. Massage the yogurt over your hands thoroughly, concentrating on any areas that are especially dry and cracked. Wrap your hands in a towel, or slip a plastic storage bag over each hand. Leave the yogurt on for five to 10 minutes to allow the lactic acid to gently exfoliate dead skin cells. Remove the towel or plastic bags and rinse your hands using lukewarm water. Use a soap-free cleanser to remove any greasy residue, if necessary. 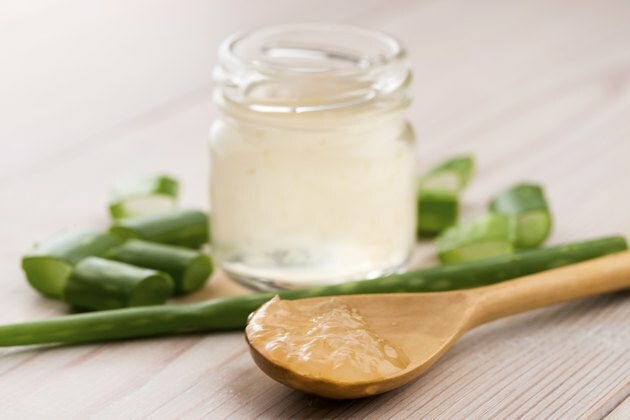 Fill a bowl with 1 teaspoon each of raw honey, olive oil and aloe vera juice. Use raw honey, which is unfiltered and often has a cloudy appearance or sediment in the bottom. Stir the ingredients well using a whisk to ensure that they are well-blended. Insert a cotton swab into the bowl until it is saturated. Rub the cotton swab lightly over the skin around each finger until all cracked and dry areas are covered. Or dip your fingertips into the bowl until they are covered with oil, then remove them. Gently massage the skin around each nail for about a minute to work the oil into the skin and soften the dry areas. Put on a pair of cotton gloves to keep the oil near the skin. Leave the gloves on overnight and remove them the following morning. Repeat the treatment at least three times a week or every night until the cracks subside. Drink water to stay hydrated, because even light dehydration can contribute to dry skin. Avoid washing your hands with soap, which will further dry out the skin. Instead, opt for a cream-based soap-free hand wash, which won't strip out moisture.